When social media went mainstream in 2008, marketers were agog at the potential to scale their messages virally at zero cost. It hasn’t quite turned out that way. 2010 may be remembered as the year of the filters, when social networks built walls to protect privacy and tier the connections of individual users. Facebook launched Groups, smaller subnetworks “where you can build a space for important groups of people in your life,” invisible to outsiders. Facebook also continued to evolve EdgeRank, its algorithm that shows only a fraction of all your friends’ posts in your “news feed” stream by judging them on affinity, comments, and recency (the closer you are to someone on Facebook, the more comments their post gets, and the timeliness of the post make it more likely to pop into your stream). Google Wave bit the dust, after the search giant screwed up by thinking it could simply port your Gmail contacts into a visible social network — but providing too much visibility, say, showing people you barely know all your email business development contacts. The new iPhone app Path invited users to build mobile networks of only 50 people, turning social media into an elite party-invite list. It all makes sense. Analysis of social networks shows that people don’t want to connect to the world; they have biases and regional group interests creating small pools of connections. Anthropologist Robin Dunbar suggested humans, like primates, can only manage about 150 relationships realistically. 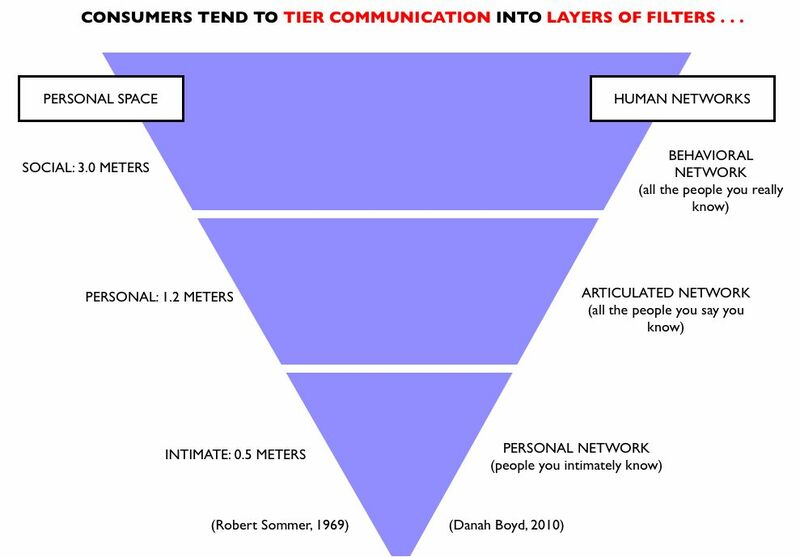 But a more apt model for understanding filtering may be Robert Sommer’s 1969 “personal space” logic, which really had three fields — distance communication, hand/tool use level content, and intimate whispers-in-your-ear messages. The psychology of how we speak to others goes back to cave days, where humans heard stories by the fire, worked with our hands, and spoke quietly to lovers. We have different needs and set up boundaries to take in messaging from each field. You see this in our tools today: movies and TVs show big images from afar; laptops and PCs give us content 3 feet way; cell phones and ear buds put intimacy near your head. If we’ve always sorted messaging by these three dimensions, we do the same with our human networks. Danah Boyd has suggested social graphs are divided into three distances: behavioral, all those we really know; articulated, those we say we know; and personal, our true intimate friends or family. The collapse of Google Wave and rise of Facebook Groups show people need to sort human contacts just as we manage our communication needs, by far, medium and close proximity. Marketers who wish to truly influence consumers by reaching their inner minds will have to be more clever and relevant. And, unfortunately for them, there is an inverse correlation between the ability to get close and the freedom to scale across vast networks to all.